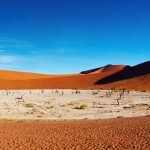 Located around Sossusvlei, there are other pans that are well worth a visit too. Just a short 4 kilometer walk away lies the Hidden Vlei. Despite the name, Hidden Vlei is actually fairly easy to find because it is clearly marked with an obvious white post to assist visitors. 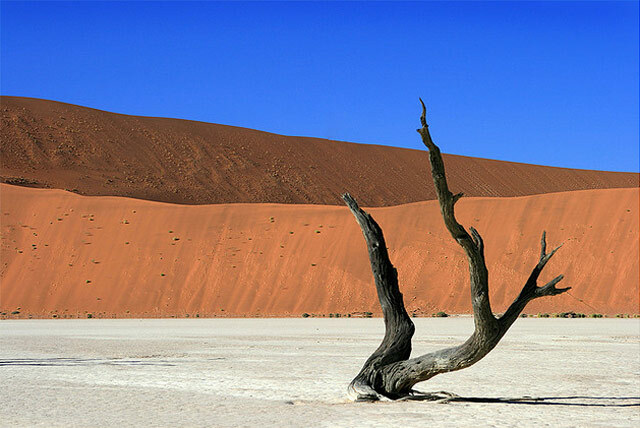 In contrast to the popular tourist attraction of Sossusvlei, Hidden Vlei is almost barren and is especially beautiful because of its distinctive feel of the area created by the shadows of dead trees which wash over the sandy slopes. 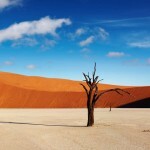 Approximately six kilometers from the Sossusvlei is the Dead Vlei, located about a two hour drive away. It is advised that you begin your journey early due to the almost unbearable heat later in the day. 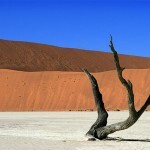 The Dead Vlei was first endpoint of the Tsauchab River but due to the build up of clay and silt deposits, the river diverted course and now ends in neighboring Sossusvlei. 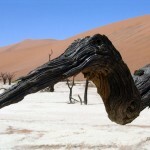 In Dead Vlei dead camel thorn trees protrude out from the bizarre dry landscape. 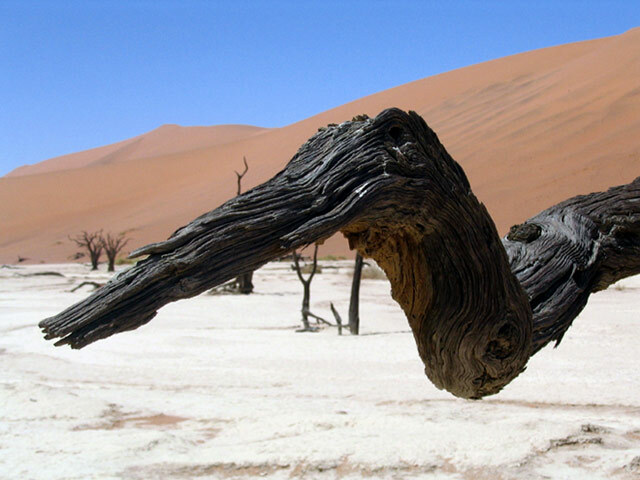 Despite the deep roots, the trees cannot get to the life-giving water because of a thick layer of lime deposit that coats the earth. 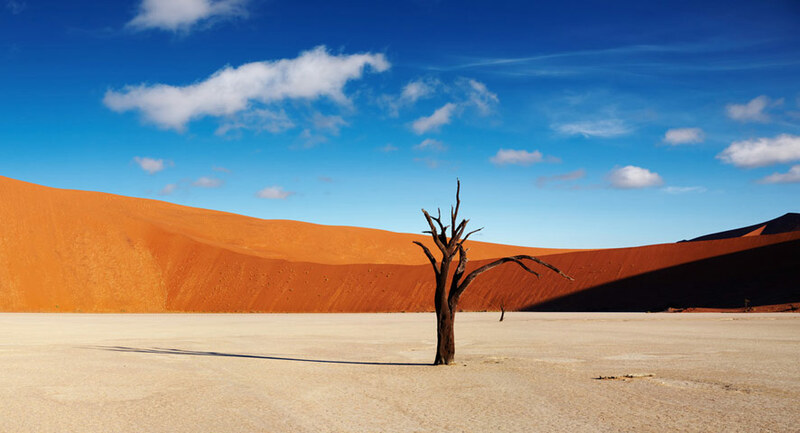 The slowly drying up and sun-bleached trees stand out starkly against the bright orange cracked clay soil of the valley and the brilliant blue of the sky. 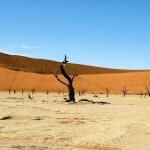 A little less known and therefore less crowded is the Nara Vlei. 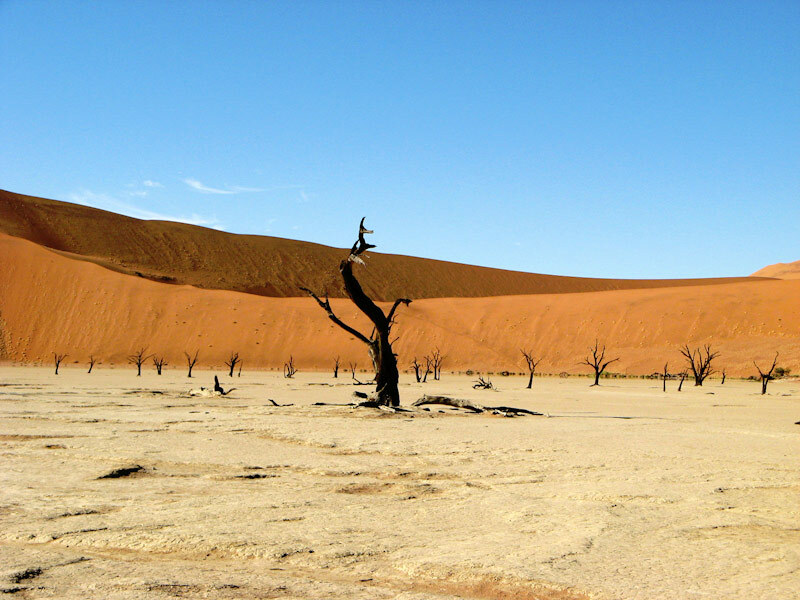 Those looking for peace and solitude will be at home in Nara Vlei, because here, the dunes are not covered by countless footsteps.